I really love pasta. I could probably eat pasta for every meal every day. And, I love cooking pasta. I even love those hours-long processes involving making homemade pasta dough, rolling it, cutting it, drying it, and then cooking it while making a complicated sauce. But, the book I want to tell you about today is not about that kind of pasta-making. This book is about regular pasta cooking or the kind you can do every day. It’s full of go-to, quick meals made from a well-stocked pantry. This is Back Pocket Pasta: Inspired Dinners to Cook on the Fly by Colu Henry, and I received a review copy. The book is intended to inspire creativity with what you have on hand rather than serve as a strict set of rules. There are pasta dishes for every season, made with and without meat and/or seafood, and the options range from light to hearty. Following the pasta recipes, a section for Salads and Sides is included as well as a guide for drinks and wine. A couple of especially pretty recipes are the Scallops, Sun Golds, and a Mess of Herbs with bright, little tomatoes and seared scallops and the Frutti de Mare with Squid Ink Pasta with the black pasta strands mixed with shrimp, squid, clams, and mussels. The Tuscan Kale “Caesar” Pasta got my attention with the fried egg on top, and I like everything about the Mediterranean Cavatappi with artichoke hearts, Kalamata olives, sun-dried tomatoes, and feta. A couple of others I want to try are the Baccala and Green Olive Pasta with Almonds and Fettuccine with Crab and Jalapenos. The first dish I made from the book is a classic, but I had to make one little change. 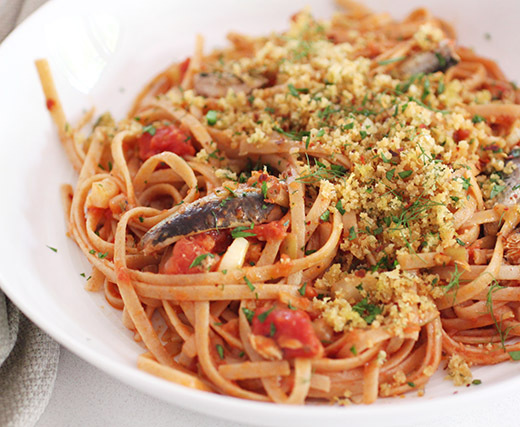 Linguine con Sarde is all about good pantry items like canned sardines, dried breadcrumbs, canned tomatoes, and olive oil. Traditionally, this dish includes some raisins for a sweet note. And, traditionally, I always skip the raisins in Sicilian dishes (including caponata) no matter how heretical. To start, the breadcrumbs were toasted in a skillet with olive oil, and then lemon zest and chopped fennel fronds were added. Next, the quick sauce was made by sauteeing chopped fennel and minced onion. Garlic and red pepper flakes were added followed by canned tomatoes. Meanwhile, water was brought to a boil for the pasta, and the linguine was cooked and drained. Be sure to keep some of the pasta cooking water before draining the pasta. 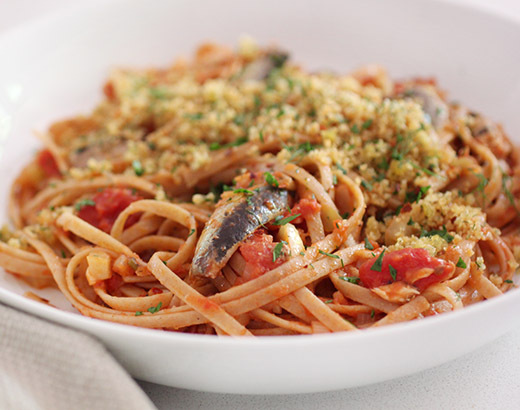 I split the sardines into fillets and removed the backbone before adding them to the sauce, and then the drained pasta was added and tossed to combine. To serve, bowls of pasta were topped with golden, seasoned breadcrumbs. The lemony, crunchy breadcrumbs are a perfect companion to the chunks of sardines in the pasta as is the sweet, sauteed fennel. As much as I enjoy pasta, I often end up using the same ingredients with it over and over. This book has plenty of ideas for changing things up and trying new combinations. Maybe I really could have pasta for every meal every day. I have a confession to make: Sometimes I’m very behind the times when it comes to food trends. I miss the excitement as everyone begins to get on board with something new, and then I’m incapable of catching up in a fashionably late kind of way. So, I thought maybe I just wasn’t hip enough for smoothie bowls or chia puddings. And, then I read a review copy of the new book Good Clean Food: Super Simple Plant-Based Recipes for Every Day by Lily Kunin and decided hip enough or not, I wanted to try these things. The book is very cheery and colorful with beautifully-styled dishes in the many photos, and it was a pleasure to read. I’ve been craving more lean and nutritious foods lately, albeit with an occasional decadent treat here or there, and this book is a nice guide to very current ideas for eating well. The author started down the path of mindful eating and avoiding gluten as a way of heading off migraines, but this book isn’t about following a specific diet plan. Instead, the mostly plant-based dishes are offered for the reader to enjoy as they are or to revise in any number of ways. There are building-block recipes and instructions for cooking beans, grains, and vegetables and prepping dressings, sauces, and toppings that give you a head-start for several of the dishes. And, in addition to food, there are recipes for homemade face masks, hair treatments, and bath salts too. My first stop in the book was at the Walnut Orange Globes page. These energy balls are quickly made in a food processor with raw walnuts, raw almonds, orange zest, lemon zest, and a pinch of salt. The balls are rolled in hemp hearts, and they are a delicious snack. I’ll be making those repeatedly now that I’ve tried them. I also made chia pudding with unsweetened coconut and almond milk and topped it with raisins and walnuts, and it instantly became my new favorite breakfast. Some other recipes I’ve marked include Moroccan Chickpea and Carrot Salad, Salted Caramel Bonbons made with dates and no refined sugar, the Cherry-Coco Ice Cream Sandwich with Double Chocolate Chews cookies, and the Taco Salad with a walnut-lentil crumble. Two other things I tried and want to tell you more about were the Mint-Chip Shake and Sweet Potato Fries with Cashew Ranch Dip. A shake and fries sounds the opposite of nutrition-focused eating, doesn’t it? But, not with these versions. The shake is made with unsweetened nut milk, some avocado, fresh spinach, super greens powder, mint leaves, vanilla extract, peppermint oil, and cacao nibs. There was supposed to be some honey for sweetening, but I used some frozen banana instead and skipped the ice cubes as well because of that frozen fruit. The ingredients were pureed in the blender and then topped with more cacao nibs. 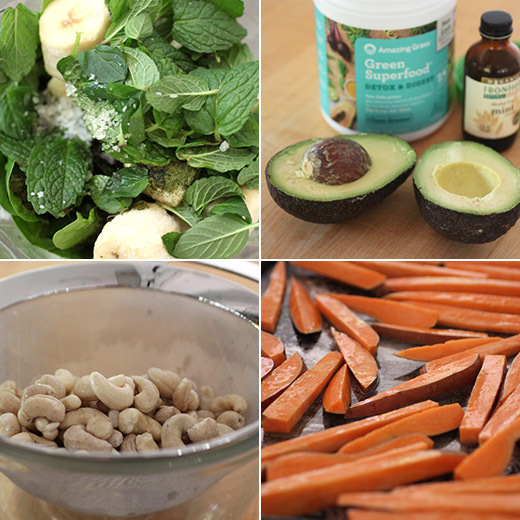 This was my first use of super greens powder, and it combines well with the ingredients here. The one I chose is an “Amazing Grass” blend with wheat grass, barley grass, alfalfa, spinach, spirulina, chlorella, and broccoli. I’ve been adding it to other types of smoothies too for a boost of nutrients. 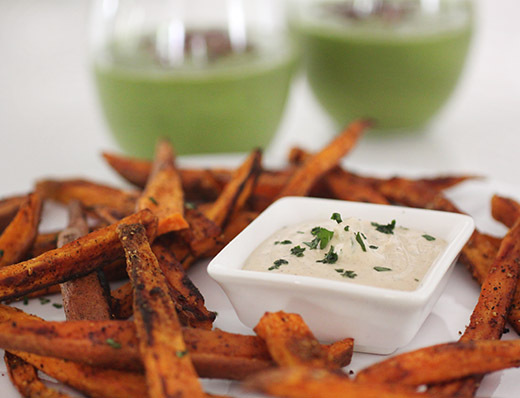 The sweet potato fries were baked with a little coconut oil. The ranch dip was made with raw cashews that had been soaked in water overnight and drained, a little water, lemon juice, garlic, cayenne, and parsley. I opted for fresh garlic rather than garlic powder. The ingredients were pureed in the blender. After reading this book and trying a few things, I could be a food trend convert. I’ve been buying more raw cashews and soaking them for purees. I made the ranch dip a second time and added a chipotle chile, and quite enjoy it as a dairy-free dip or dressing. The Mint-Choco shake tasted far richer and more decadent than it should have. The chocolate flavor from the cacao nibs and the fresh mint were delicious together, and all those nutritious ingredients were a bonus. I’m glad to have this book with me in the kitchen now and look forward to trying more. 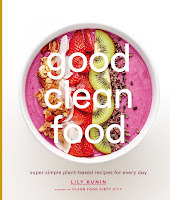 Recipes reprinted with publisher’s permission from Good Clean Food: Super Simple Plant-Based Recipes for Every Day . Mint chocolate chip ice cream was my all-time favorite as a kid, largely because of the neon green color. My preferences have shifted since then, but I’m still all for a beautiful, bright green shade if it’s made from spirulina, chlorella, or spinach! 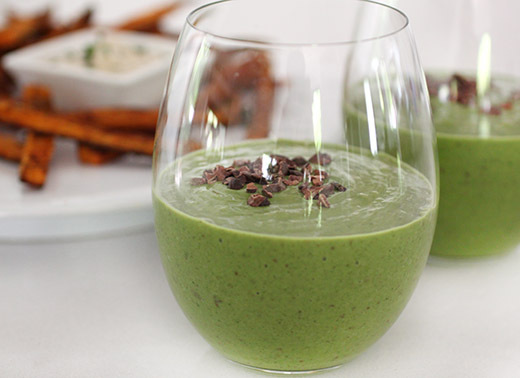 In this smoothie, the peppermint mimics the classic ice cream flavor. Combined with creamy avocado, crunchy cacao nibs, and some natural sweetness from the raw honey, this makes an out-of-this- world midday energy bump. Use stevia in place of the raw honey, if you prefer. In a blender, combine the nut milk, avocado, spinach, green powder, mint leaves, 2 teaspoons of the honey, the vanilla, salt, and ice. Add a few drops of peppermint oil—if you’re using the extract, you’ll need more than that. Puree until the mixture is well combined. Taste and adjust the honey as needed. Blend again, then add the cacao nibs and pulse briefly to combine. Serve the shake topped with additional cacao nibs, if desired. This recipe might be my hands-down favorite snack ever. Sweet, crispy on the outside, and slightly spicy, these fries disappear once they hit the plate. Unlike regular French fries, sweet potato fries are much more nutrient-dense, and won’t slow you down. The key to getting them to crisp up is giving them enough room to breathe on the pan—they shouldn’t touch each other!—so they don’t end up steaming. Serve with creamy cashew ranch dip. For the fries: Preheat the oven to 375°F (190°C). Line a rimmed baking sheet with parchment and set aside. Lightly coat the sweet potatoes with the oil and toss them with the spices and a few pinches of salt and pepper. Lay the potatoes out on the baking sheet in a single layer. Make sure they don’t touch, as this will help them crisp up. Bake them for 35 to 40 minutes, turning them halfway through. They are done when they are golden on both sides and cooked through. Let them cool slightly before serving. For the dip: In a food processor or blender, combine the cashews, water, juice of one of the lemons, garlic and onion powders, cayenne, paprika, and salt. Puree until the mixture is creamy. If needed, add more water to reach your desired consistency. Transfer the dip to a small bowl, stir in the herbs, and season with additional lemon juice and salt and pepper to taste. Chill for 30 minutes before serving to let the flavors meld. I’m not a vegan, or a vegetarian, but I like to dabble in that space. Most of the time I prefer plants to meat, and a lot of what I cook is meatless. So, I was intrigued by a new book called Smith & Daughters: A Cookbook (That Happens To Be Vegan) from a Melbourne restaurant of the same name that happens to stick to a vegan menu. The goal of the restaurant menu and of the book is to offer “plant-based food the way it should be: big, bold, flavorful, noteworthy, celebration-worthy, and myth-dispelling.” Rather than focusing on the conscientious reasons most people choose to follow a vegan diet, here plant-based cooking is a jumping-off point for creativity. The food is inviting, fun, and hearty. The Breakfast Burrito is made up of a few homemade components and is a great example of the flavorful cooking seen throughout the book. The burrito is made with homemade Chipotle Cashew Cheese, Brazilian Black Bean Soup, Spicy Ground Chorizo made with textured vegetable protein, and Tofu Scramble. Something to note about the ingredient lists is that you will see things like “chicken stock” and “butter.” But, in the Book Notes at the beginning, it’s mentioned that vegan substitutes for those types of items are intended. The delicious-looking Sopa Seca is made with broken angel hair pasta, chipotles in adobo, and vegan chicken stock. Some other dishes I want to try include the Warm Hearts of Palm Salad served with guacamole; the Artichoke and Chickpea Salad with Lemon and Cumin Vinaigrette; and Spanish Meatballs made with brown rice, bell peppers, oats, brown lentils, and chickpea flour. 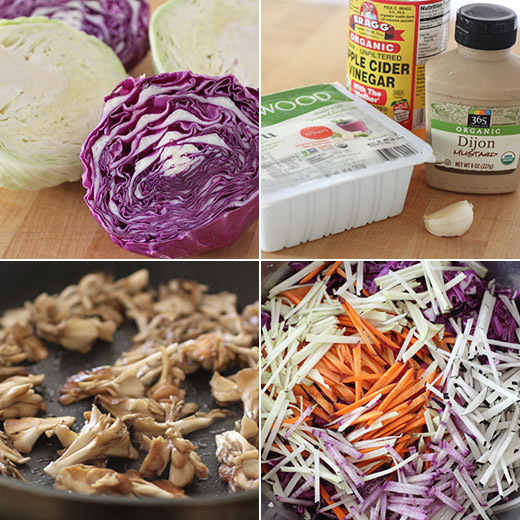 The recipe that got me cooking first, though, was Brazilian Slaw. This brought back a memory of a cooking class I attended taught by Susan Feniger. 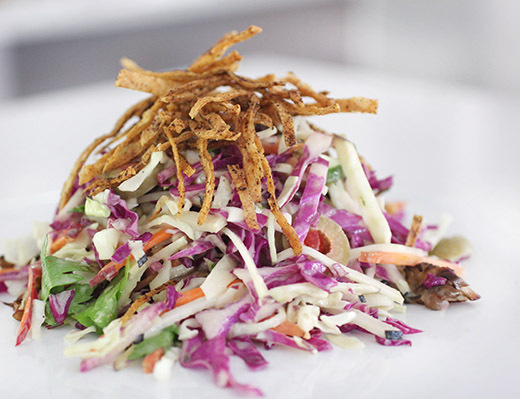 The title of that class was Inspired by Brazil, and one of the dishes was a Vegetable Salpicon or slaw. I still have the notes and recipes from that class (I keep the notes I receive from cooking classes filed away), and that slaw is the dish I remember most. Feniger’s version was topped with crispy shoestring potatoes, and the mix of vegetables was slightly different. The general concept was the same, and I couldn’t wait to try the version from this book. Here, the crispy topping was baked corn tortilla strips rather than fried shoestring potatoes. They were baked until golden and crunchy and set aside to cool. I made a couple of substitutions based on what was fresh and in season right now. So, instead of using corn and apple, I used a mix of radishes. Along with radishes, carrots were also cut into julienne strips. Red and green cabbages were thinly sliced into ribbons. Mushrooms, and I used maitake instead of oyster just because they looked better that day, were seared with soy sauce until browned and allowed to cool. Last, pimento-stuffed green olives were sliced. To make the dressing, first a vegan aioli was prepared. It was made in the blender with silken tofu, garlic, apple cider vinegar, Dijon mustard, and olive oil. The aioli was mixed with lime zest and juice and more garlic to form the slaw dressing. The vegetables were combined in a big bowl along with parsley and cilantro leaves, and all was topped with dressing. The mixture was tossed until well coated and served with tortillas strips on top. I’m always a fan of crunch, and it’s abundant here. The vegetables are crunchy, and the tortilla strips are really crunchy, and all that texture made this fun and delicious to eat. The aioli is also a perfect base for other dressings. I used what was left from this recipe to make a green goddess dressing for another salad. And, I also made the Coriander Cashew Cream with added chipotle to use on tacos. I may not be vegan all the time, but thanks to recipes like these more plant-based meals are showing up on my table. Recipe excerpted with permission from Smith and Daughters: A Cookbook (that happens to be vegan) by Shannon Martinez and Mo Wyse, published by Hardie Grant Books March 2017, RRP $35.00 hardcover. 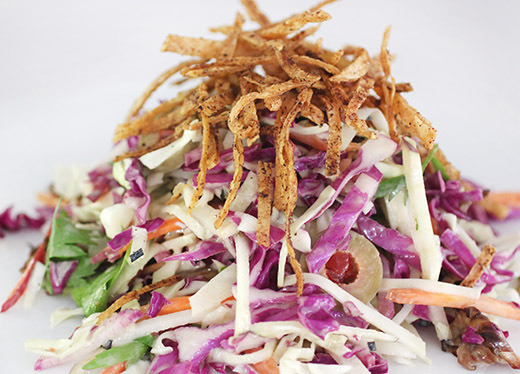 As far as salads go, you just don’t get prettier, with more texture, more variety and more fun. Preheat the oven to 180ºC (350ºF). Heat 2 teaspoons of the oil in a chargrill pan or small frying pan. Grill or saute the corn until lightly charred. Remove from the heat and set aside. Heat the remaining oil in a medium-sized frying pan over medium heat. Add the mushrooms and soy sauce and sauté until golden and slightly crisp. Set aside to cool. To make the dressing, combine the ingredients in a bowl and whisk together until well combined. To build the salad, combine all of the ingredients in a large salad bowl and add enough of the dressing to lightly coat. Season with salt and pepper, to taste. For the garnish, spray the tortilla strips with olive oil spray and dust with a little chilli and lime salt. Transfer to a baking tray and bake in the oven until crisp. If you are using tortilla chips, just sprinkle with the chilli and lime salt instead. Build a small conical tower with the salad and top with the garnish. Big salads are always better, especially when tortilla chips are involved. As often happens when reading cookbooks about food from faraway places, I’m suffering from a bit of travel envy. Imagine beginning a journey in France and then continuing to several beautiful places where French colonies were established just to follow the trail of culinary influences. How fun and delicious would that be? That’s how the new book Provence to Pondicherry: Recipes from France and Faraway by Tessa Kiros came to be. There’s a chapter devoted to each stop along the way. It begins with Provence and continues to Guadeloupe, Vietnam, Pondicherry, La Reunion, and then ends in Normandy. So, the recipes begin with French classics and then veer off into use of flavors from other climates prepared with French influences. 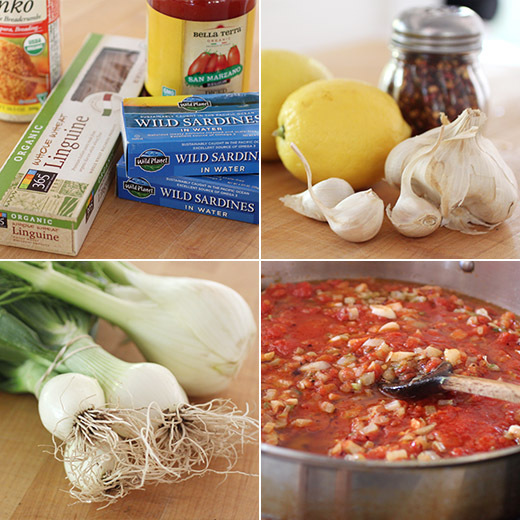 The Court-Bouillon de Poisson from Guadeloupe is made with chiles, garlic, tomato, and beurre rouge with annatto seeds. From Vietnam, Banh Mi is of course made with baguettes, and the creme caramel includes lemongrass. Some hints at French influence in foods from Pondicherry include milder flavors with fewer chiles as in the Pondicherry Chicken curry. I lost track of time when I got to the La Reunion chapter due to the fruits, rum, coconut, and interesting uses of vanilla. There’s a braised duck dish made with split vanilla pods and a mashed potato dish that incorporates vanilla-steeped warm milk. I walked straight to the kitchen when I read about the Punch de Coco. Seeds from a vanilla pod were added to coconut milk, and it was chilled while the flavor infused before being served with rum. I highly recommend this combination. Also from this chapter, I had to try a very French-sounding dish of gratineed fruit made with very un-French fruits. 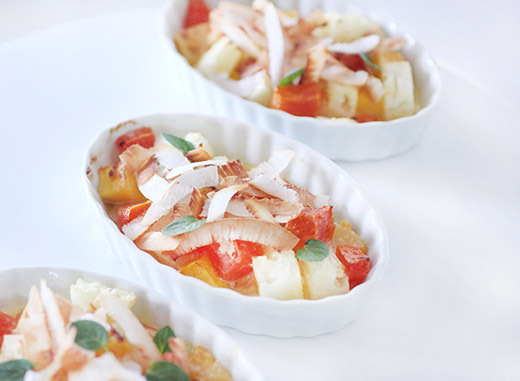 In the book, lychees, guava, strawberry guavas, pineapple, and mango are suggested for the gratins. But, some of those were too exotic for me to find them. Instead, I used chopped pineapple, papaya, and mango. The process is very simple once all the fruit is chopped to a similar size. Ramekins were buttered and filled with a mix of the fruit. A tablespoon of cream and one of rum was added to each ramekin followed by some ginger, and I used freshly grated. Bits of butter were dotted on top before putting the ramekins under the broiler until browned. I should mention that sugar was supposed to have been sprinkled over the fruit, and it definitely would have brought about more browning. I chose to skip the sugar since the fruits were already very sweet. 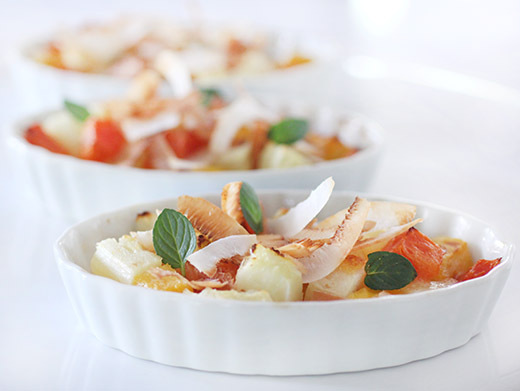 I garnished with toasted slices of fresh coconut and some mint leaves. The cream and butter made this rich and decadent while the fruits and ginger added a mix of fresh flavors. And, I’m always happy when there’s rum. This dish seemed to perfectly highlight the point of intermingling cultural influences. A very French technique of gratinee-ing with butter and cream was applied to ingredients specific to a different spot in the world to bring about something uniquely delicious. Recipe excerpted with permission from Provence to Pondicherry: Recipes from France and Faraway by Tessa Kiros, published by Quadrille March 2017, RRP $35.00 hardcover. 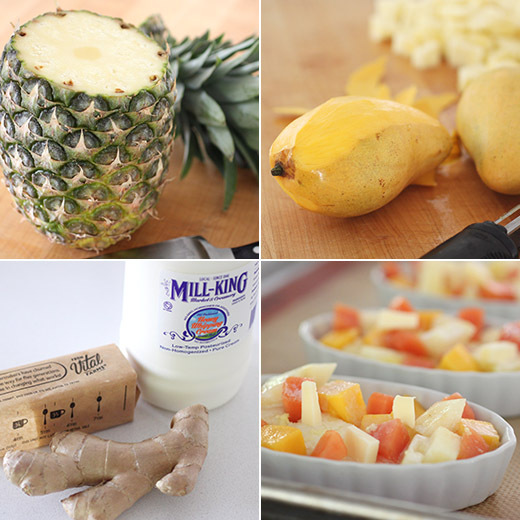 The amounts here are very easy to adjust according to how much fruit you will be using and the type. Just use a good variety. Add more or less rum to suit your taste. Lightly butter 2 shallow ramekin dishes, about 11cm (4 1/4 in) diameter and 3cm (1 1/4 in) deep. Divide the fruit between them. Splash the cream and rum over each, followed by 2 blobs of butter each. Mix the sugar and ginger together and scatter evenly over the tops. Preheat the grill (broiler) to hot. Grill until deep golden and charred here and there. Let it cool down just a little before serving.